Kalo Livadi beach is located on the south side of Mykonos, between Elia and Kalafatis and is one of the largest and most popular beaches. Everybody prefer this beach for its blue crystal waters and its fine golden sand. It is one of the beaches that combine everything: relaxation, entertainment, facilities and amenities, which is why is one of the favorite beaches of locals, tourists and secular people. Families with young children also prefer this beach, because the water is shallow and the sand is very fine, perfect for playing. Recent years have seen strong growth, but it is big enough and there is a distance between the deck chairs to make you comfortable. For those who want to combine swimming with entertainment, in some parts of the beach there are beach bars. There you will often hear someone famous dj playing music and during the evening they organize parties. If you prefer calmer situations, there are very good restaurants, with organic products, Mediterranean and international cuisine, which will surely delight you with the great recipes and the beautiful decor. All restaurants and beach bars have excellent and attentive beach service, so that you can enjoy swimming with every comfort and experience their outstanding dishes from your deckchair. In the center of the beach there are water sports such as wake board, wake surf, ski, jet ski, tubes, and other water games for endless hours of fun. However, if you just want to relax and unwind, Kalo Livadi beach is so long that you will not be bothered by anyone. 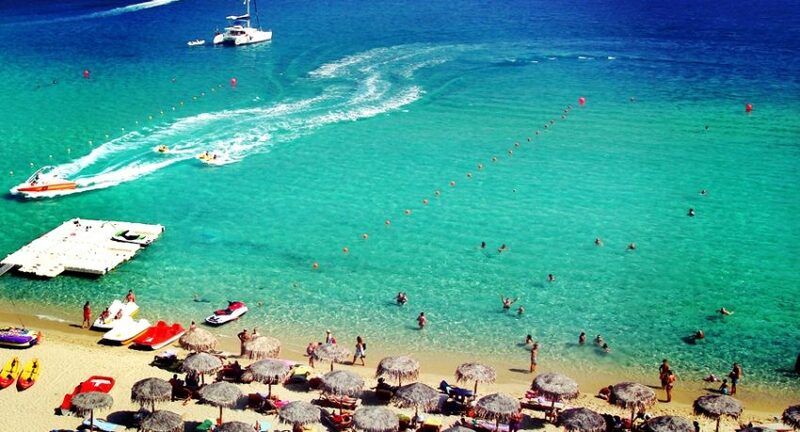 Access the beach is possible either by bus or by sea transportation starting from Platis Gialos or by your own vehicle. Distance from Mykonos Town: 11 Km.